From 1945 to 1975, West Vancouver was a centre of innovative residential design that became known as West Coast Style. Local landscapes and climate had great influence on the development of the new style. Perched between forested mountains and expansive ocean, in a rainforest climate, West Vancouver’s natural setting presented unique challenges and opportunities that came to be reflected in West Coast Style houses. Building sites in West Vancouver were often rocky and irregular, with spectacular views of the ocean or native forests. These constraints and opportunities demanded inventive new designs simply to make construction feasible or to take advantage of site characteristics. The rejection of traditional styles and design details led to the use of complex geometric forms and open-plan layouts, with rooms often used for more than one purpose. Natural light was a central element, and glass was used extensively for both windows and skylights. West Vancouver's temperate climate meant architects and designers were less hindered by climatic constraints. By the mid-1950s, a small group of leading-edge designers began to reshape residential architecture in British Columbia. 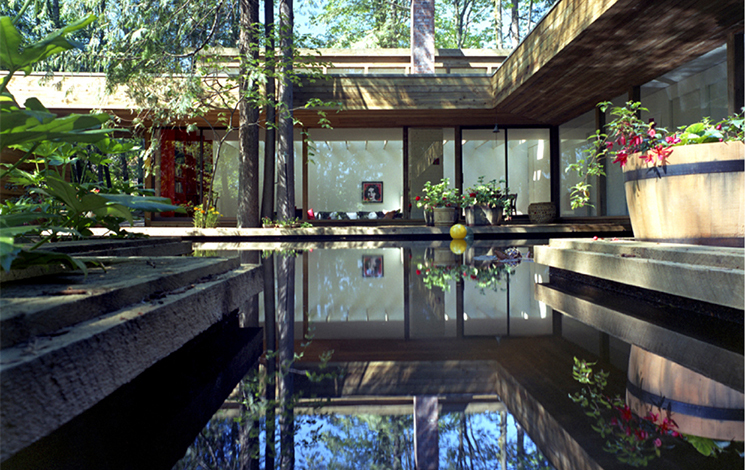 Later referred to by Arthur Erickson as The Vancouver School, their work would be internationally recognized. Foremost among the local designers was Arthur Erickson. He was best known for Vancouver area landmarks such as Simon Fraser University’s Burnaby Mountain campus, the Provincial Law Courts in downtown Vancouver and the Museum of Anthropology at UBC. Erickson’s partnership with architect Geoffrey Massey between 1963 and 1972 also produced many homes that exemplify West Coast Style. Ron Thom was one of the most creative and accomplished designers of the era. Much of his finest work was undertaken while employed by Thompson, Berwick, Pratt & Partners during the 1950s and 1960s. Strongly influenced by American architects Frank Lloyd Wright and Richard Neutra and a prolific designer himself, Thom’s work received numerous national and international awards. Ned Pratt was an early innovator of modernistic residential design and was instrumental in popularizing the International Style in British Columbia. His firm Thompson, Berwick, Pratt & Partners was the style's leading proponent in Canada. Pratt’s work often emphasized strong expression of structural elements. Many other talented architects contributed to the evolution of the West Coast Style. Fred Hollingsworth, Barry Vance Downs, and CBK Van Norman added their individual creativity to the emergent style. More than the product of one architect, the West Coast Style found expression in highly individualistic works that shared fundamental design principles. As the West Coast Style became established, local builders began to embrace it. While these house designs tended to be conservative, the best examples were no less innovative or significant than their architect-designed counterparts. As West Vancouver’s post-war residential development increased, design-build firms promoted contemporary residential designs. Among the most prolific was the Lewis Construction Company, which built hundreds of residences in West Vancouver. The company’s designs were widely recognized and often published in magazines of the period. Another local builder and developer, Alex Browning, organized the “Parade of Homes” In 1956, to demonstrate modern innovations in post-war residential construction. Competing builders built show homes along West Vancouver's Bonnymuir Drive ranging from post-and-beam to split-level and ranch-style. This further popularized modern residential design in West Vancouver. Preservation of West Vancouver’s exceptional collection of West Coast Style residences is challenging. Because they are relatively new, their heritage value is often overlooked. In 1994, West Vancouver began to recognize these buildings' significance through its Survey of Significant Architecture 1945-1975. This architectural survey identified 124 buildings of primary or secondary importance. Inclusion in the inventory identifies their heritage significance but does not ensure their preservation. At present, the B.C. Binning Residence is the only municipally designated heritage building from this period (it is also designated a National Historic Site). Preservation of these properties largely depends on individual property owners who recognise their heritage significance. For more information, please contact the Planning Department.